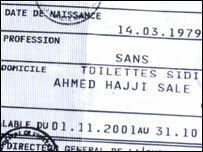 A family living in a public toilet in Morocco have spent seven years requesting more hygienic accommodation. Their pleas fell on deaf ears, and Aze Adine Ould Baja has had to endure the ignominy of having "toilets, Sidi Ahmed Hajji district" as the official address on his identity papers. Desperate to do something about their plight, Mr Baja and his wife Khadija Makbout recently went to a local newspaper with their story. "I was fed up with the situation and I was becoming more and more ill," Mr Baja explained. "There were lots of vermin in the toilet. My little boy is only seven months old but he is also a Moroccan citizen and deserves better." But a few days later the local authorities moved in to block up the toilet's entrance with cement and concrete. 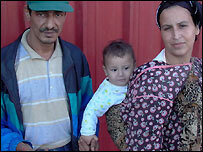 Mr Baja, his wife and three children now find themselves barred from the only home they had. In a narrow street of the old medina in Sale, the city across the river from the capital, Rabat, Mr Baja explained how he fell into poverty and ended living in the public lavatory, where he was the attendant. He worked at the toilet for 23 years, where he earned less than $1 a day. "How can a married man feed his children on a dollar a day?" he asked. His troubles began several years ago when his daughter was kidnapped and he had to sell everything to try to find her. She was eventually found, but he could not afford to rent the place where he had been living and the family moved into the toilet as a temporary measure. "My children and I have suffered a lot," Ms Makbout told the BBC. "Rats and mice were eating and tearing our clothes and I was afraid that they would harm my baby boy. I was sleeping near the drain. "I asked the authority for a place where my children could live but they did nothing." Mrs Makbout said the she hated seeing her children grow up in this situation. "When my son went to school, the other children would tease him and call him 'the boy from the toilet'. "When he came home he would cry and asked me why we lived in the toilet." At one stage the family were offered a place to live but it had no roof. For the moment the family are squashed in with Ms Makbout's mother. They have been promised somewhere else by the authorities but so far nothing has happened. Now destitute, without a job or home, Mr Baja despairs of his situation. "My children are tired of getting hungry." "I have health problems and poor blood circulation, so I have to go to hospital about three times a year. I could die at any time." All these troubles make him consider emigrating. "When I feel myself dying of hunger and I can see that my children are dirty and suffering - I no longer want to stay in Morocco." "I think I may find a boat in Tangier and take my wife and children away. "Maybe we will die in the middle of the sea. Maybe it will take us to a place where it is easier to get something to eat. "But we would find it hard to leave Morocco, because we are proud of it." While investigating the story a police officer came up to me and asked for my identity card. He took it away and detained me briefly in the local police station. I also tried to speak to a local government representative about the family's situation, but no-one was available for an interview. Although this family's story is unusual, it is not altogether surprising. Hundreds of thousands of Moroccans live in abject poverty in slums and shanty towns. Some of those slums have produced the recent waves of suicide bombers. It reflects the huge gap between rich and poor in Morocco: some people live in luxury, others live literally in a toilet.